The occupants of both vessels totalling 21 people had to be rescued following engine failure. 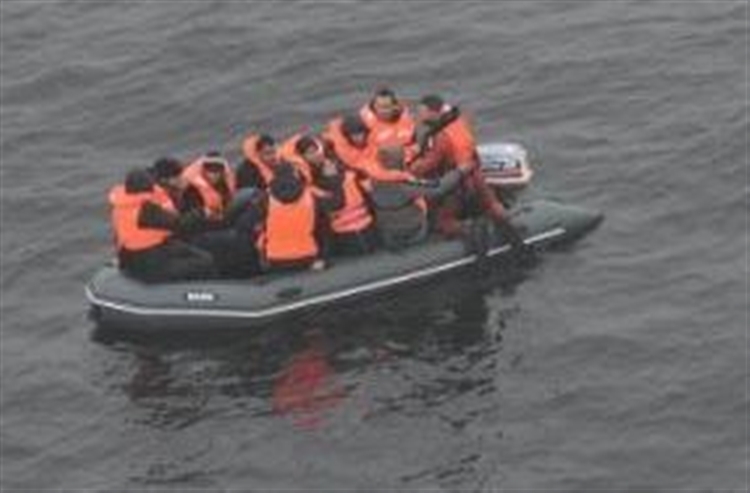 At 4.55am today nine migrants in one vessel eight miles north of the Pas de Calais called for help from the department’s Gendarmerie at Arras. A French Navy helicopter and vessels from the coastal Gendarmerie patrol (Patrouilleur Côtier de Gendarmerie – PCG) and France’s national sea rescue organisation (Société Nationale de Sauvetage en Mer – SNSM) were sent in. 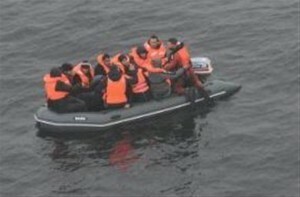 The migrants were picked up by the Gendarmerie vessel Athos and handed to border police at Calais. Then at 6.47am 12 migrants, included two children, were located 14 miles west of Boulogne. Again a Navy helicopter, and vessels from the Gendarmerie were sent in. These migrants, two of them suffering slight hypothermia, were recovered by the SNSM and brought on land to border police at Boulogne at 9.15am. Details of these two cases came from the French maritime authority for the English Channel and North Sea, préfecture maritime de la Manche et de la mer du Nord. Today’s cases are believed to part of the continuing trend of migrants trying to reach Britain by small craft. These two incidents bring the total of migrant incidents to 59 – involving 519 people – since November 8. This figure includes rescues on the French side of the Channel and isolated cases such as four migrants stowed away in a cargo ship of Margate last December. At least 419 people in 48 cases involved people landing on Kent shores or being rescued by authorities and brought here for questioning.